Goodwell, Okla.—A very welcome return to Anchor D Arena saw the Panhandle State men's basketball team take a conference victory (92-78) over Texas Wesleyan Thursday evening. While fans welcomed the team back from an extended holiday break, the Aggies welcomed back some integral players who made an instant impact on both ends of the court. Junior forward Jaedon Whitfield returned from a week-three injury and fell right back into his double-double ways, racking up 19 points and a game-high of ten rebounds; Whitfield clocked 33 minutes in his first return appearance. 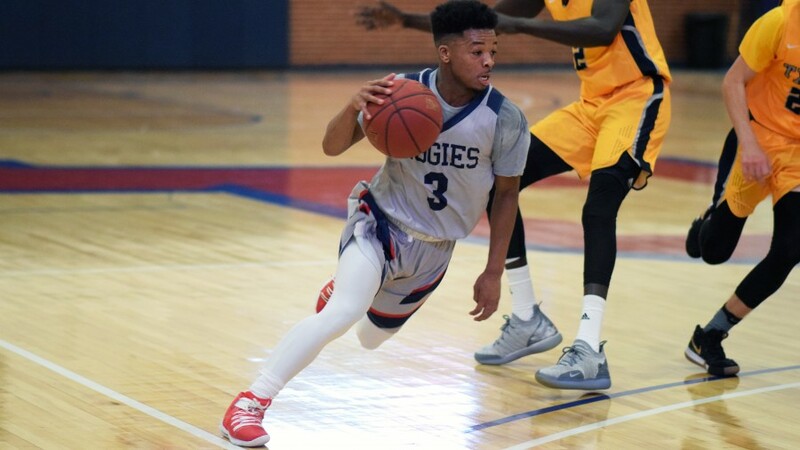 Transfer guard Khallid Edwards made his debut performance for the Aggies and will quickly become a crowd favorite with his quick moves and solid shooting. Edwards notched 17 points and averaged 80 percent from the field for the night while offering up one rebounds and two assists in the game. Head Coach Aaron Coombs spoke on the duo stating, "It was great to see Jaedon [Whitfield] and Khallid [Edwards] play in front of our home crowd. Both guys gave us a much-needed boost and played incredibly hard." All five Panhandle State starters posted double-digits in scoring led by Breiman Alexander, who also recently returned from an injury. Alexander tallied a game-high of 27 points and contributed five rebounds, three assists and two steals on the night. He also led the game in three-point shooting, taking down four shots beyond the arc. Baris Ulker matched Whitfield's efforts at the boards and earned his sixth double-double of the year with ten rebounds and 16 points. Rounding out the starting lineup, Alan Hodge, Jr. finished with 13 points, four rebounds and a game-high of five assists. For the game, the Aggies averaged over 53 percent in shooting and landed 44 percent of their shots from three-point territory; the team went 15-20 at the line. Coombs went on to say, "I am incredibly proud of how our guys came out and competed. I thought from the start we had an edge to us and a confidence to go out and competed at a high level." The Aggies now stand 7-4 on the season and hold a 2-3 record within the Sooner Athletic Conference. Coach Coombs concluded, "I'm happy for our team and want them to celebrate every win because winning in this league is tough. We have another difficult game ahead of us." The men's team will face another SAC opponent this weekend with a matchup against Southwestern Assemblies of God University on Saturday, Jan. 5 at 4 p.m. The game is sponsored by PTCI and will offer a "Black Out" theme for fans who wish to partake. Live streaming and stat links will be available online at opsuaggies.com.